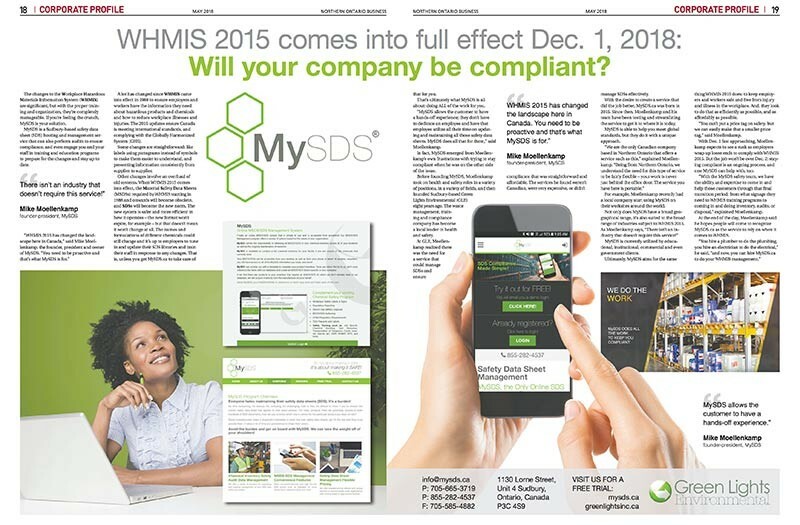 WHMIS 2015 comes into full effect Dec 1, 2018 | Green Lights Inc.
Will your company be compliant? The changes to the Workplace Hazardous Materials Information System (WHMIS) are significant, but with the proper train-ing and organization, they’re completely manageable. If you’re feeling the crunch, MySDS is your solution. MySDS is a Sudbury-based safety data sheet (SDS) hosting and management sevice that can also perform audits to ensure compliance, and even engage you and your staff in training and education programs to prepare for the changes and stay up to date.